Hi, I am interested in your 1985 Jeep CJ 7 (stock #1328-NSH) listed on Autotrader for $27,995. I'd like to get more information about this vehicle and confirm its availability. Do you ever want to go explore the road less traveled? Head down a dirt road out in the woods, or explore the outer reaches of a park system? 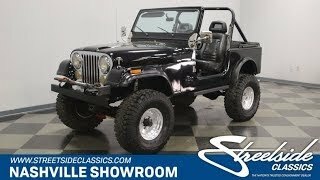 Then this CJ7 might be the vehicle you need. It can take you to work during the week, and take you as far away from it as possible on the weekend. You probably noticed from the picture, that this Jeep sits a little higher than usual. Some would say that is how a Jeep is supposed to sit. It has about a 4 lift. Then they mounted those big and beefy Goodyear Wrangler MT/Rs on deep dish aluminum alloy wheels and stuffed them up under the fenders. They look great! And those dish wheels have got to be easier to keep clean than spoked wheels. The look gets even better with the glossy black paint dressed up with a bit of chrome. Up front the chrome grill has wire brush guards on all the lights and a heavy-duty front bumper with tow hooks has a high lift jack mounted across the top of it. Chrome windshield hinges as well as side mirrors add a splash of flash and the full soft top is in good condition for when you want to keep the weather out, but gives you the option of removing parts of it or all of it for some fun in the sun. Climb inside and you will find Jeep simplicity with a twist. The entire floor has been coated with bedliner for a good look and easy cleaning. The twist is the upgraded dash panel with white faced Autometer Phantom II gauges to keep track of your speed, RPM, fuel, water temp, and oil pressure. A racing electrical panel has water proof rocker switches lined up for easy operation, with color coded lights above them for easy identification at night, and the fuse for each circuit below it. You sit up high in the bucket seats so you can see everything around you if you are in traffic, and that beefy steering wheel feels good in your hands. The shifter for the automatic transmission is mounted on the column and the one for the transfer case is on the floor. Between the front buckets is a nice big, lockable, center console with lots of places to stash things as well as a couple cup holders. Pop the hood, (as long as you dont have the windshield folded forward onto it), and you will find a 350 cubic inch V8 motor nestled down in that engine bay. It is a throttle body injected motor with an AIRAID free-flow intake feeding it lots of cool, fresh air. Spent gasses are handled by headers that wind their way out the bottom and back to a Flowmaster muffler. Signs of good regular maintenance include a newer brake master cylinder and brake booster. Power flows back through a 4-speed automatic transmission and the transfer case to solid axles mounted on leaf springs both front and rear. Power steering makes it easy to maneuver around in parking lots with those big tires, and a steering damper helps when you are playing off road. Power front disc brakes provide great stopping power and the rubber meets the road, or the trail, through those 35X12.50 Goodyear Wrangler MT/Rs. Come on down and check this Jeep out. It can get you around town in style, and is set up for some good clean off-road fun too. So, go ahead, play rough if you want to.